Dr.S.Annadurai has studied in Government College of Technology, Coimbatore and obtained his B.E Degree in Electronics and Communication Engineering in the year 1975 from Madras University. 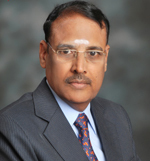 Later he got his two Master Degrees one in M.E (Power Systems) in the year 1981 and the other in M.E (Computer Science and engineering) in the year 1990 from Madras and Bharathiar Universities respectively. He had an opportunity to get sponsorship from MHRD and did his Ph.D programme in full time under Quality Improvement Programme (QIP) during 1993 to 1996. He started his career as Junior Engineer in ELECOS, Chennai a division of the Quasi Govt. Company Southern Structural Limited (SSL). Then he migrated from industry and joined as Associate Lecture in the year 1978 at Govt. College of Technology, Coimbatore where he was graduated. Recognizing his contributions and services he was promoted as professor and head of Computer Science and Engineering Department in the year 1997. Appreciating his leadership and research contributions he was elevated as Principal in the year 2004 and posted at Govt. College of Engineering, Thrunelveli. There he had involved in the Technical Quality Improvement programme and developed the Institution to have the state of art infrastructure and laboratory facilities. Later appreciating and recognizing his services he was transferred to Govt. College of Technology a premier college as Principal. He has served as Chairman and expert committee member for various apex bodies like Governing Body, Governing Council, Chairman of Academic Council and BoS, Result Passing Board and Chairman for Valuation Boards. Finally he was promoted as Additional Director of Technical Education (Poly) and posted at DOTE office Chennai. He was also served as Director of Technical Education Incharge for a few months. He is very much involved in Research and Guided 17 scholars to receive their Ph.D degree and 3 scholars to receive their MS / Mphil degrees. He has published 335 research articles in International / National Journals and Conferences. His areas of Specialization include Pattern Recognition, Digital Image Processing, Neural Networks and Fuzzy Neural Networks and Computer Networks. He has also received funds for the sponsored research project for a tune of Rs.70 Lakhs. He has visited a few foreign universities listed below to study the Education System followed by them. (i) University of Central Florida, Orlando. (ii) Newjersy’s Science and Technology University, Newyork. He is having wide knowledge in Circuit Branches and has contributed a lot for the Technical Education for the past Forty Years. His current responsibility is Advisor for the Hindusthan Group of Technical Institutions.